Single-center experience with the Zeiss Rescan 700 microscope-mounted OCT system. Since its development more than 20 years ago, optical coherence tomography (OCT) has been a revolutionizing force in ophthalmology. 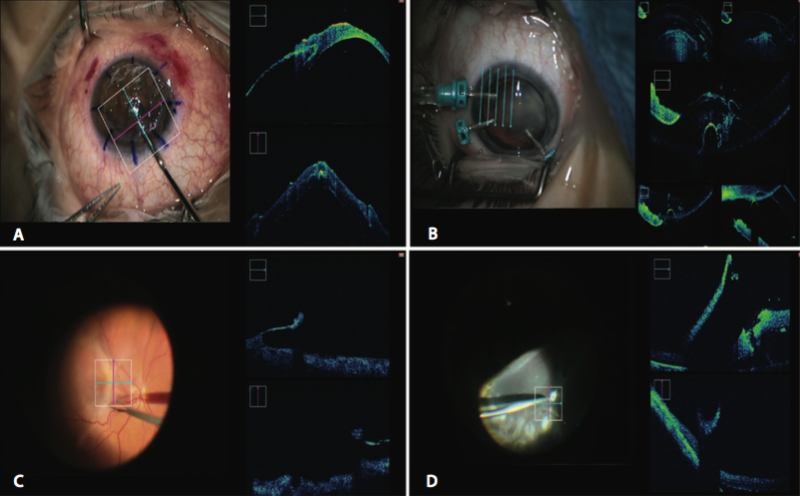 Recent advances, which include the introduction of spectral-domain OCT (SD-OCT) and swept-source OCT, have improved resolution and have consequently made OCT an essential tool for the diagnosis and management of posterior segment pathology.1,2 In the past several years, increasing emphasis has been placed on migrating OCT technology into the OR.3 A microscope-mounted form now allows acquisition of real-time intraoperative OCT (iOCT) images. In this article, we report our initial experience with a microscope-mounted iOCT system and discuss potential surgical applications for this evolving technology. • Microscope-mounted OCT now allows acquisition of real-time intraoperative OCT (iOCT) images. • Real-time analysis with microscope-mounted iOCT provides an immediate impact on surgical planning and decision-making. • The ability to control placement of the iOCT allows microscopic precision of instrument placement during surgical maneuvers. In this single-site, multisurgeon study approved by Bascom Palmer Eye Institute’s institutional review board (Table), 10 attending faculty surgeons were involved in at least part of each surgery in 31 eyes (unpublished data). The iOCT used was the Rescan 700 microscope-mounted OCT system (Carl Zeiss Meditec), which integrates SD-OCT into the Opmi Lumera 700 surgical microscope (Carl Zeiss Meditec). The Rescan provides footpedal control of OCT scanning, which allows the surgeon to switch seamlessly between surgical view and real-time scan view and to control the OCT positioning on the x, y, and z axes. Several capture modes similar to tabletop OCT machines are available, including cube and 5-line raster scans. Figure 1. iOCT affecting surgical decision-making in pediatric patients (surgeon view and corresponding OCT scan). Corneal connection typical of Peters anomaly that was undiagnosed before the surgery (A). Incomplete development of the retinal layers that characterize coloboma formation (B). Progression of corneal dissection in a case of anterior segment dysgenesis (C-G). At each level of the dissection, the surgeon used the iOCT to explore the depth of each cut. In the end, with the iOCT showing no freely moveable level of tissue, the decision was made to perform a penetrating keratoplasty. Donor graft in place (G). During our study, a Zeiss technician who could control the focus and positioning of the OCT from an external monitor that displays the same view as the heads-up display was present. Surgical footage, including the iOCT scans captured, was stored on the Callisto eye system (Carl Zeiss Meditec), and data collection was focused on retrospective qualitative analysis performed on surgical footage and the accompanying iOCT scans. The OCT scanning feature was used during all 31 cases. The real-time microscopic analysis of the anatomy—both the vitreoretinal interface in the posterior segment and the relationships of the cornea, lens, and iris in the anterior segment—and associated pathology proved helpful in cases with difficult intraoperative visualization, especially those in which preoperative OCT was not able to provide a definitive understanding of the pathology involved. This was exemplified during three pediatric cases. In one case, iOCT enabled the identification of the corneal-lenticular touch typical of Peters anomaly, which was not clearly seen on preoperative ultrasound, and this eventually led to a decision to proceed to an anterior lensectomy. In another case, it allowed visualization of communicative traction along the coloboma-retina margin to plan the path of photocoagulation. In a third case, iOCT helped the surgeon delineate the layering of a corneal opacity secondary to anterior segment dysgenesis, which assisted the surgeon during corneal dissection and helped make the decision to proceed with a penetrating keratoplasty (Figure 1). The x-y-z axis control and multiple capture modes of the iOCT enabled surgeons to directly align the scan with the surgical instrument to allow visualization of instrument-tissue interaction at a microscopic level. This ability was noted to enhance precision during particular surgical maneuvers (Figure 2). This was shown, for example, during the initiation of epiretinal membrane (ERM) peeling, channeling above Descemet membrane layer during a deep anterior lamellar keratoplasty, excising a scleral band, and in trocar placement for pars plana lensectomy. The iOCT was a helpful tool to confirm results at the end of surgery, and it afforded the surgeon a chance to immediately intervene if these results were not adequate (Figure 3). The scanning was used in this capacity to confirm the removal of interface space between the host and donor during Descemet stripping automated endothelial keratoplasty (DSAEK) and to identify the complete removal of the ERM during membrane peeling. No adverse intraoperative events were reported during the study. Figure 2. Surgical instrument-tissue interactions (surgeon view and corresponding OCT scan). Channeling above the Descemet membrane layer during deep anterior lamellar keratoplasty (A). Trocar placement in the anterior chamber during pars plana lensectomy (B). Forceps peeling layer of ERM during membrane peel (C). Serrated forceps taking part of subretinal band for pathologic testing (D). The ability to easily control placement of the iOCT to the point of interest permits microscopic precision of instrument placement during surgical maneuvers. This capability is especially useful in procedures in which perioperative OCT has been shown to enhance precision and surgical outcomes, including most vitreoretinal procedures such as ERM peeling. Several studies have shown the importance of perioperative OCT in the context of ERM peeling, both in preoperative surgical planning and postoperative correlation of poor visual outcome with macular findings such as recurrent ERM.9,10 We confirmed this in showing that real-time iOCT can guide the surgeon in peeling the precise layer and assessing end results by immediately visualizing the outcome after peeling. Postoperative OCT is used to track surgical changes and identify complications. Many complications, even those with symptoms that present well after surgery, have been shown to occur at a decreased incidence with certain intraoperative modifications. An example of such a complication is primary graft failure after DSAEK, which can occur in as many as 23% of cases. Studies have shown that careful surgical management of the graft-host interface can help optimize surgical success and decrease incidence of graft failure.11-12 During the DSAEK cases in our study, surgeons used iOCT to definitively show absence of fluid in the interface between donor and host. Figure 3. iOCT confirming surgical changes (surgical view and corresponding OCT scan). The guidance of iOCT proved helpful in reducing interface space between host and donor interface in DSAEK surgery as shown: after placement was thought to be correct (A) and after a sweeping maneuver reduced interface space (B). iOCT confirmed removal of entire ERM after membrane peel as shown in the before (C) and after (D) views. A limitation we noted, and that was also seen in a study by Ehlers et al, was shadowing caused by surgical instruments crossing the OCT scan area.13 Improvement in visualization may be possible with the use of OCT-compatible instrumentation, the effectiveness of which has been demonstrated in prototypes.7 Other studies using the Rescan 700 have noted a learning curve in focusing to the point of interest with the OCT, as well as some difficulties in coordinating image resolution with Zeiss technicians.13,14 In this study, the learning curve was present, but we noticed marked improvement over time. 1. Puliafito CA, Hee MR, Lin CP, et al. Imaging of macular disease with optical coherence tomography. Ophthalmology. 1995;109(2):217-229. 2. Major JC Jr, Wykoff CC, Mariani AF, et al. Comparison of spectral-domain and time-domain optical coherence tomography in the detection of neovascular age-related macular degeneration activity. Retina. 2014;34(1):48-54. 3. Hahn P, Migacz J, O’Connell R, et al. The use of optical coherence tomography in intraoperative ophthalmic imaging. Ophthalmic Surg Lasers Imaging. 2011;42 Suppl:S85-94. 4. Scott AW, Farsiu S, Enyedi LB, et al. Imaging the infant retina with a hand-held spectral-domain optical coherence tomography device. Am J Ophthalmol. 2009;147(2):364-373. 5. Dayani PN, Maldonado R, Farsiu S, Toth CA. Intraoperative use of handheld spectral domain optical coherence tomography imaging in macular surgery. Retina. 2009;29(10):1457-1468. 6. Ehlers JP, Dupps WJ, Kaiser PK, et al. 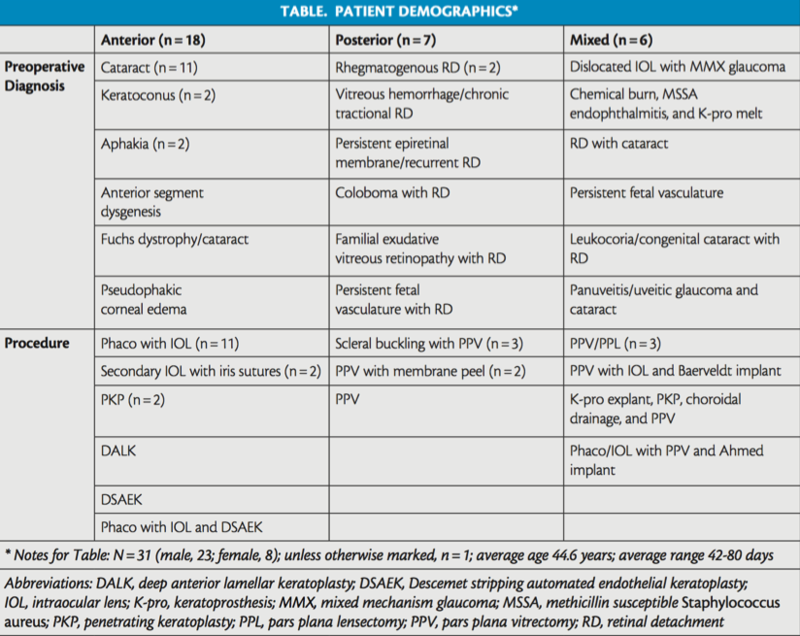 The prospective intraoperative and perioperative ophthalmic imaging with optical coherence tomography (PIONEER) study: 2-year results. Am J Ophthalmol. 2014;158(5):999-1007. 7. Ehlers JP, Tao YK, Farsiu S, et al. Visualization of real-time intraoperative maneuvers with a microscope-mounted spectral domain optical coherence tomography system. Retina. 2013;33(1):232-236. 8. Tao YK, Srivastava SK, Ehlers JP. Microscope-integrated intraoperative OCT with electrically tunable focus and heads-up display for imaging of ophthalmic surgical maneuvers. Biomed Opt Express. 2014;5(6):1877-1885. 9. Goldberg RA, Waheed NK, Duker JS. Optical coherence tomography in the preoperative and postoperative management of macular hole and epiretinal membrane. Br J Ophthalmol. 2014;98 Suppl 2:ii20-23. 10. Falkner-Radler CI, Glittenberg C, Hagen S, et al. Spectral-domain optical coherence tomography for monitoring epiretinal membrane surgery. Ophthalmology. 2010;117(4):798-805. 11. Suh LH, Yoo SH, Deobhakta A, et al. Complications of Descemet’s stripping with automated endothelial keratoplasty: survey of 118 eyes at one institute. Ophthalmology. 2008;115(9):1517-1524. 12. Ide T, Wang J, Tao A. Intraoperative use of three-dimensional spectral-domain optical coherence tomography. Ophthalmic Surg Lasers Imaging. 2010;41(2):250-254. 13. Ehlers JP, Kaiser PK, Srivastava SK. Intraoperative optical coherence tomography using the RESCAN 700: preliminary results from the DISCOVER study. Br J Ophthalmol. 2014;98(10):1329-1332. 14. Kumar RS, Jariwala MU, V Sa, et al. A pilot study on feasibility and effectiveness of intraoperative spectral-domain optical coherence tomography in glaucoma procedures. Transl Vis Sci Technol. 2015;4(2):2. • associate professor of clinical ophthalmology at the University of Miami, Bascom Palmer Eye Institute, in Miami, Fla.
• professor of clinical ophthalmology and medical director of pediatric retina and retinopathy of prematurity at the Bascom Palmer Eye Institute in Miami, Fla.
• professor of ophthalmology and the Lou Higgins Chair in Ophthalmology at the University of Miami, Bascom Palmer Eye Institute, in Miami, Fla.
• professor of ophthalmology and the Leach Distinguished Professor of Ophthalmology at the University of Miami, Bascom Palmer Eye Institute, in Miami, Fla.
• third-year medical student at the University of Miami Miller School of Medicine in Miami, Fla.
• professor of ophthalmology and the J. Donald M. Gass Chair of Ophthalmology at the University of Miami, Bascom Palmer Eye Institute, in Miami, Fla.
• retina fellow at the University of Miami, Bascom Palmer Eye Institute, in Miami, Fla.
• professor of ophthalmology at the University of Miami, Bascom Palmer Eye Institute, in Miami, Fla.
No conflicting relationship exists for any author. 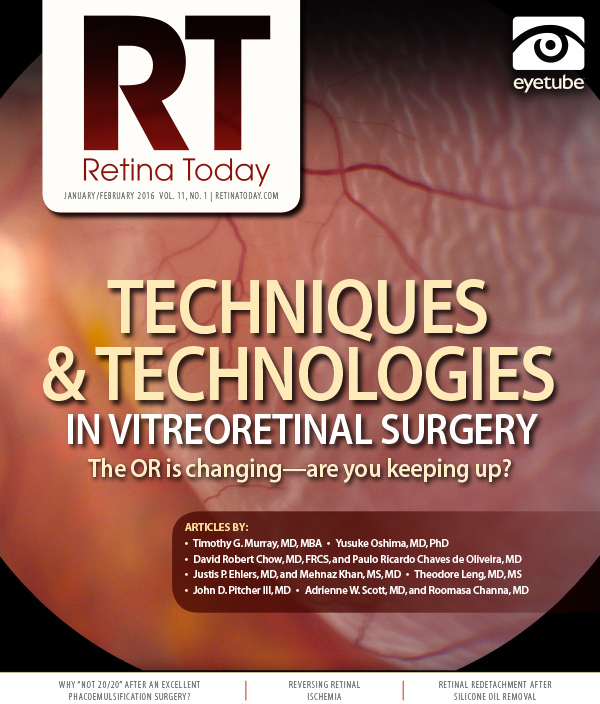 Are You Ready for the Future of Vitreoretinal Surgery?